An organisation management company, Face Partnership, was brought in to attempt to create a series providing regular top level events at the velodrome. The aim was to provide racing for existing fans and attract new fans to the sport, raising its profile as a sport in United Kingdom. It was decided that the series would consist of four events throughout the season. Admission costs were fixed at an affordable level, originally £8 for an adult ticket, in order to enable families to attend. Family tickets were available for around £20, making the Revolution a considerably more affordable event to attend in comparison to other sports, such as football. The first event was held in October 2003 and was attended by a good sized crowd. The event featured big British names like Bradley Wiggins, Rob Hayles, Chris Newton and David Millar. The event continued to grow in stature and profile from this solid start, exceeding expected attendance targets along the way. Revolution 7 in early 2005 saw the series achieve its first near capacity crowd, the start of the event had to be delayed to allow the crowds into the venue. Revolution 14 was the series' first complete sell out, with some ticketless fans turned away. From early 2008 onwards the events began to sell out in advance. The Revolution is also expanding into a global series, CotterPin has licensed the concept in Australia. The first Revolution Australia event was held in the Darebin International Sports Centre, Melbourne on 24 November 2007. There were over 3,000 spectators present at Australia's Revolution 1. In July 2008, the Aftermarket company signed a deal with Face Partnership to create an expo area in the track centre at each event. This takes advantage of the captive audience and precise target consumers present at each Revolution. Each Revolution meeting consists of a fast paced, packed programme of races. The evening lasts for between 3 hours and 3 hours 45 minutes and typically involves around twenty events. Each event has three categories of racing including sprint and endurance, and the "Future Stars" series. Live PA duties at the events are carried out by the BBC commentator and cyclist, Hugh Porter. In 2011-12, ITV4 broadcast a one-hour highlights show on Monday evenings following each Revolution meeting. In September 2015 it was announced that Eurosport would broadcast live coverage of five rounds of the 2015-16 series. In April 2016 a collaboration between FACE Partnership and Velon, an organisation representing 11 UCI WorldTeams, was announced to expand the Revolution series internationally as the Revolution Champions League, with the inaugural Champions League competition being held across three consecutive weekends in November and December 2016. The competition is planned to feature a total of 12 teams, of which eight will be drawn from the World Tour ranks. In June 2016 seven WorldTeams were confirmed as participants in the first Champions League, which would consist of six rounds held over three back-to-back weekends in Manchester, London and a third venue abroad, which was confirmed the following month as the Vélodrome National in Paris. Each meeting features a main Revolution Sprint competition, alongside other various events including the Keirin and Team sprint. The sprint competition is usually a straight knock out event, typically with a first round, semifinal and final. For some events a sprint ominium has taken place, with all riders facing each other at some point during the evening and the most successful winning overall. A male sprinting competition usually takes place at each event, with Women's sprinting generally appearing for one event each year also. The events featured alongside the main sprint competition are tailored to the card of sprinters appearing and has included various challenges and revenge matches over the years. They regularly attract major British names and a host of international challenges. The list of World and Olympic Champions to have appeared include Chris Hoy, Theo Bos, Arnaud Tournant, Jason Kenny, Victoria Pendleton, Jamie Staff, Jens Fiedler, Grégory Baugé, Ross Edgar, Craig MacLean, Jason Queally, René Wolff, Jan van Eijden, Florian Rousseau, Stefan Nimke, Maximilian Levy, Teun Mulder, Robert Förstemann, Mickaël Bourgain, Willy Kanis, Christina Muche and Clara Sanchez. Every Revolution event has included elite endurance field of riders, racing over a number of events throughout the night. Events featured include the points race, scratch race, Madison, individual pursuit, team pursuit, motor-paced scratch race and devil elimination scratch race. Typically the blue ribbon Madison feature race takes place once a year and is named the Isaac Galvez Memorial Madison. This is in memory of the Spanish rider who died during the Ghent Six Day meeting in 2006 while he was World Madison Champion. This was one week before he was due to appear at Revolution 15. The endurance racing attracts both major track riders and stars of the road, throwing up a number of unique contests over the years. The list of major names (on the track or the road) to have appeared include Bradley Wiggins, Mark Cavendish, Geraint Thomas, Ed Clancy, Joan Llaneras, Paul Manning, Bradley McGee, Chris Newton, Rob Hayles, Sergi Escobar, Steve Cummings, Stuart O'Grady, Iljo Keisse, Matthew Gilmore, Franco Marvulli, Bruno Risi, David Millar, Peter Schep, Robert Slippens, Nicole Cooke, Rebecca Romero and Graeme Obree. As well including the major events from the World Championships and Olympics, the Revolution series also tries to feature some unique and exclusive races at its events. The Madison 1 km time trial is one such exclusive event. This event is a major crowd pleaser and takes place at each event. This is run over 1 km, four laps of the track, and consists of two riders running two laps each. After the first rider has completed their laps they do a Madison hand sling with their partner and they then complete the final two laps. While this by nature is an endurance riders event, its one kilometre distance has also meant that sprinters have also tasted success. 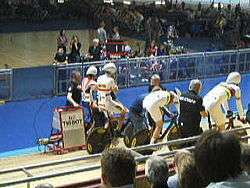 An early record for this event was set by Mark Cavendish and Ed Clancy at 58.5 Seconds at Revolution 7 in January 2005. This record stood until sprinters Craig MacLean and Arnaud Tournant, set a new record of 55.1 seconds at Revolution 16 in January 2007. This was then further bettered when Tournant teamed up with Chris Hoy at Revolution 20 in February 2008. Tournant had a shoulder injury which prevented the duo doing a proper hand sling change over, however they still posted a record time of 54.4 seconds. This record stood until being broken by Ed Clancy and Ollie Wood in 2014. A new challenge event added to the programme in 2008 was the sprinters v pursuiters challenge. The first of these races took place at Revolution 21. This saw members of the GB Team sprint squad, Jamie Staff, Jason Kenny and Ross Edgar, face off against members of the GB team pursuit squad, Ed Clancy, Geraint Thomas and Steven Burke. The race took place over three laps with a flying start, so very much was a mix between the sprint and endurance disciplines. Due to the three lap length of the race, the same as the Team Sprint event, it was expected by its nature to favour the sprint squad. However it was noted that the endurance squad regularly carry out similar short drills during training, so the playing field was quite level going into the event. The endurance squad were able to turn the flying start to their advantage and took a clean victory over the sprinters. A rematch took place at Revolution 22, with the race extended to four laps with a standing start on this occasion. Matthew Crampton joined the sprint squad and Rob Hayles joined the endurance squad. The fast start of Jamie Staff allowed the sprint squad to take revenge and level the series. It is expected that this unique challenge event may return at future events. Other special events have included the Geoff Thomas Charity Challenge Race at Revolution 20. This involved Geoff captaining a team of riders against England Rugby World Cup winning Captain, now England coach, the 6 ft 7 inches tall Martin Johnson. This was a 5 lap team sprint style challenge race, with each team including star riders like Chris Hoy, Victoria Pendleton, Arnaud Tournant and Peter Schep. The teams were drawn at the start of the evening, equally sharing out the riders. Team Thomas won by 0.1 seconds and raised a good sum of money for the Geoff Thomas Charity Foundation. The second round of the 2012-2013 Revolution series (round 38 in Manchester) included a women's omnium event. The Dutch Marianne Vos won, including the elimination race, this omnium event ahead of the British Lizzie Armitstead. Ellen van Dijk from the Netherlands won the points race, Katie Colclough the scratch race and the British team the team pursuit. Alongside the senior racing, the Future Stars competition also runs at each Revolution event. This series involves young riders, usually 14-16 year olds and provides them to race in front of big crowds from an early age. They are put through a number of sprint and endurance races. Points are scored in each race and count towards the overall leader board. The winner is crowned at the end of the four meeting series. Some youngsters of these series became later elite athletes. Including Jason Kenny, who by the age of 24 already three gold Olympic medals and one silver. Another multiple Olympic Champion is Laura Trott, who won two gold medals at London 2012 at the age of 20 years. Other Olympic medalists include Steven Burke (one gold and one bronze), Peter Kennaugh (one gold), Dani King (one gold) and Lizzie Armitstead (one silver). The London 2012 Olympic squad included a large numbers of riders to have come through the series. 1 2 Carlton Reid (2008-07-10). "Aftermarket signs expo deal with track series". Bike Biz. ↑ "Revolution, Manchester Velodrome". Bike Biz. 2008-01-12. ↑ "A Revolution for Australian track cycling?". Cyclingnews. 2007-10-09. ↑ "THE REVOLUTION BEGINS IN AUSTRALIA". Revolution. 2007-11-30. ↑ "Christmas arrives in city". Express and Star. 2008-11-27. ↑ "Eurosport announced Revolution Series broadcast partnership". British Cycling. 30 September 2015. Retrieved 1 October 2015. ↑ "Kangert not concerned over Nibali's Trentino form, Revolution Champions League launched - News Shorts". cyclingnews.com. 22 April 2016. Retrieved 24 April 2016. ↑ "Velon roadies to tackle track racing". VeloNews. 23 April 2016. Retrieved 24 April 2016. ↑ Wynn, Nigel (27 June 2016). "Seven WorldTour teams taking part in the new Revolution Champions League". Cycling Weekly. Retrieved 25 July 2016. ↑ Clarke, Stuart (28 July 2016). "First rounds of Revolution Champions League to take place in Paris". bbc.co.uk. Retrieved 12 August 2016. ↑ "Great Britain cycling team set for Revolution Series opener at Derby Arena". British Cycling. 20 May 2015. Retrieved 2 June 2015. ↑ "Video: Revolution Series, round three: Rapha-Condor-JLT's Ed Clancy and Ollie Wood set 1km Madison time trial record - Telegraph". Telegraph.co.uk. 6 January 2014. ↑ "38 Series.10 Results" (PDF). Revolution. 1 December 2012. Wikimedia Commons has media related to Revolution (cycling series).